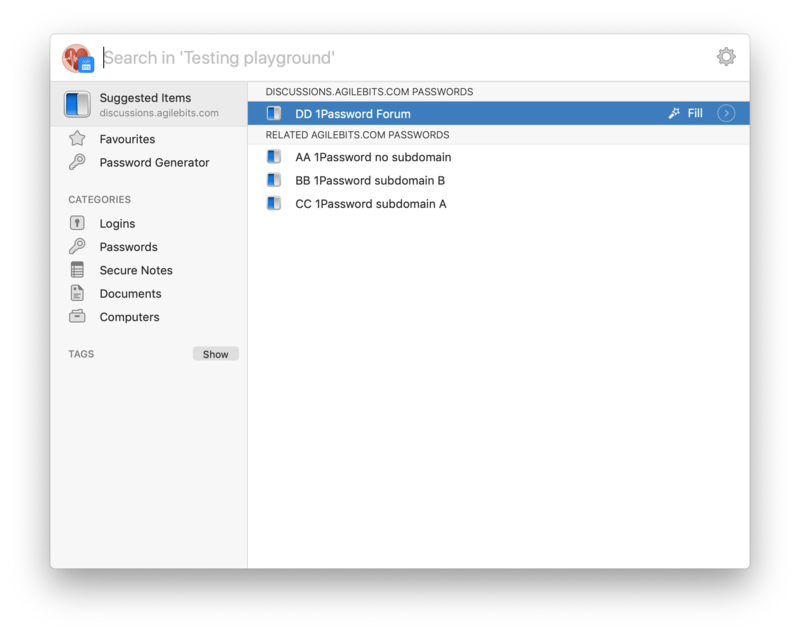 1PasswordX can fill HTTP Basic, but why can't 1Password mini? It would be very helpful, as I have to fill in many HTTP Basic every day. So why don't I just use "X"? That's because it is inferior in it's URL matching. In a corporate environment many URL's have the same domain, and it doesn't look at the sub-domain like 1Password mini does, so that's why 1Password mini is preferred. 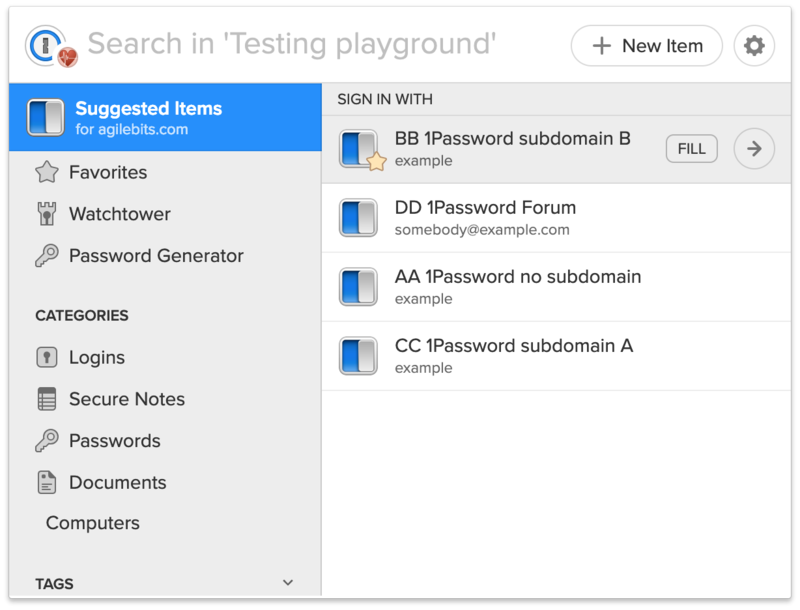 While there is slight difference in the UI (User Interface) between say 1Password for Mac and 1Password X they display Login items in the same order for me. Any favourite item for the registered domain name comes first followed by exact matches to the FQDN (Fully Qualified Domain Name), so including subdomain. After that are the partial matches to the registered domain name. The UI difference is that 1Password for Mac has a divider between the partial matches and the rest but the ordering is still the same. I don't know if the companion extension will support basic auth prompts. I wouldn't want to discount it now that one client does support it but 1Password X being a self-contained client does confer it certain advantages.The companion extension on the other hand does need to support a range of versions for both 1Password for Mac and Windows. My hope though is if the only issue with 1Password X was subdomain matching that we should be able to make 1Password X work for you. Could you maybe tell us more about an example where you're not seeing the desired ordering? One example is "test.salesforce.com", which is displayed as 10th on my list, so I need to scroll. On top I've got "login.salesforce.com" followed by many others. I went into the first one, and under "websites" there is no "test.salesforce.com" listed. 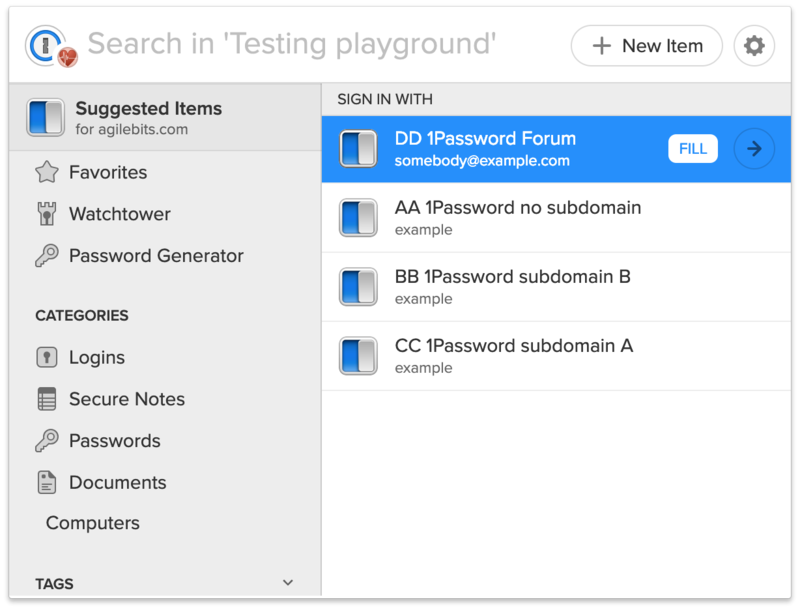 BTW 1Password mini was just updated before I did this test. So the page you have loaded in your browser displays as test.salesforce.com but unlike 1Password for Mac with the companion extension there are 9 other Login items ranked above the desired one, would you say that is accurate? I'm not sure if you can easily show us this in a screenshot without potentially revealing something you wouldn't want to in a setting as public as our forum so we may need to shift the conversation to email but I want to show you a screenshot I've taken in 1Password X using a few fake Login items. So that was created with https://discussions.agilebits.com loaded. The first match is the one that matches against the FQDN (Fully Qualified Domain Name) while the other partial matches are below. The weird titling is so we can see that it isn't sorting by title alone after matching to only the registered domain name. I can alter the ordering by use of the favourite setting but that would apply equally to 1Password for Mac with the companion extension. 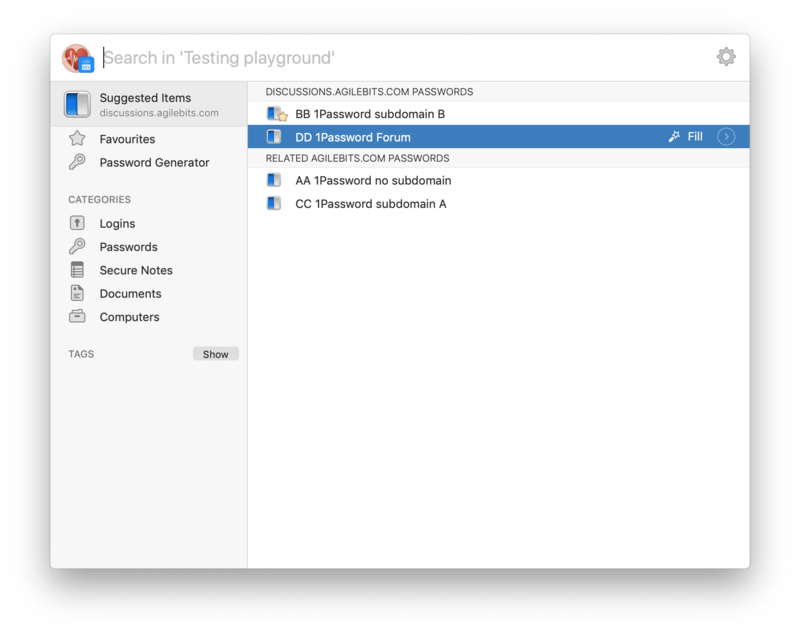 If I want to compare 1Password X to what I see with the companion extension. There must be an explanation as to why you're not seeing the same but we haven't found it yet. Yes, it is accurate. The sorting order you show looks perfect, but not what I'm seeing. I'm on Windows. Could we move to e-mail, since I don't want to post to much publicly? Please contact me. Done We'll continue the conversation over email.